AURORA, OH: Network Technologies Inc (NTI) introduces the ENVIROMUX® Micro Environment Monitoring System to its popular line of environment monitoring products. 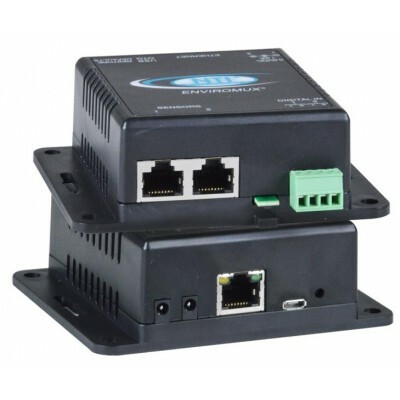 The system functions independently or as an IP-connected remote sensor for the ENVIROMUX-2D/5D/16D Enterprise Environment Monitoring Systems. The ENVIROMUX-MICRO-T features an integrated temperature sensor, two RJ45 sensor ports for external temperature/humidity sensors, and two dry contact inputs. The ENVIROMUX-MICRO-TRHP features an integrated temperature/humidity sensor, two RJ45 sensor ports for external temperature/humidity sensors, two dry contact inputs and built-in Power over Ethernet (PoE). Available for immediate sale, the ENVIROMUX-MICRO-T costs $162 and the ENVIROMUX-MICRO-TRHP costs $210.